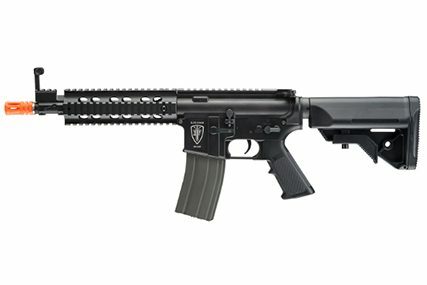 The next gen line of Elite Force M4 CQB rifles feature an improved tappet plate for higher durability and enhanced sector gear for more reliable feeding from the magazine. We moved away from the traditional M4-style hop-up and used a rotary-style design to add more stability and easy of adjustment. The M110 AEG spring offers just enough power to keep within CQB-friendly velocity limits without sacrificing any available range. 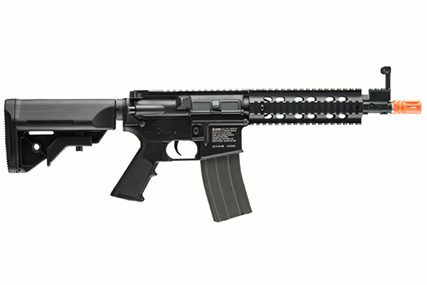 Externally, the Elite Force M4 CQB has been optimized for close quarter engagements with a shorter, 10″ outer barrel to give the shooter an ideal balance between range/accuracy and maneuverability in small spaces and around tight corners.